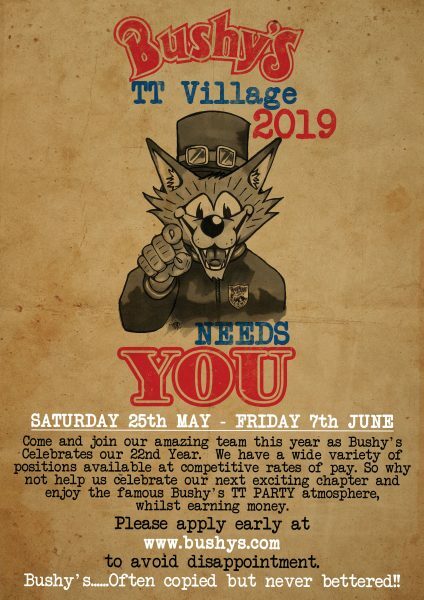 Want to work in the Bushy’s T.T. tent? Apply here! HELLO FOLKS, WE JUST NEED TO ANNOUNCE THAT FOLLOWING UNPRECEDENTED RESPONSE TO OUR ADVERTS ALL POSTS AT THIS YEARS TENT HAVE NOW BEEN FILLED. WE UNDERSTAND SOME PEOPLE HAVE HAD DIFFICULTY CONTACTING US AND WE SINCERELY APOLOGISE TO ANYONE WHO THIS HAS AFFECTED. MOST POSITIONS WERE FILLED BY STAFF WHO HAVE WORKED BEFORE, SO IT’S NOTHING PERSONAL. APOLOGIES AGAIN AND THANKS FOR APPLYING.